"These green cookies are delicious anytime of the year. Make some green frosting for these cookies using a sugar cookie icing recipe found on Cookierecipe.com"
Preheat oven to 350 degrees F (175 degrees C). Lightly grease baking sheet. Cream together the butter or margarine and the pudding mix. Blend in the baking mix, egg and sugar and mix well. 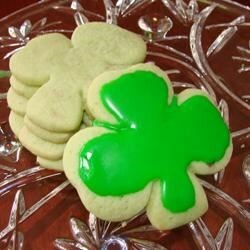 On a lightly floured surface roll out the dough to 3/8 inch thickness and cut into cookies with a shamrock cookie cutter. Place cookies on the prepared baking sheet and bake at 350 degrees F (175 degrees C) for 9 to 10 minutes or until lightly browned on the edges. Let cookies cool on rack. Frost with green colored icing if desired. This recipe has been a family favorite for a long time and I am so very glad that I was able to find it on your site, because in my moving the recipe somehow was lost. This recipe is more like a sweet biscuit. Not very sweet. The cookies come out a lovely festive color, but the dough is very sticky and hard to handle. I thought these were tasty, although my husband and kids said they were just o.k. I also added chopped pistachios to the mix. Thanks Mary Beth!